The sea, palm trees and 300 days of sunshine per year! Welcome to Hyères. Ideally located a stone's throw from the train station, the ibis Styles welcomes you. Put your feet up at the spa or enjoy a cocktail on the rooftop... Perfect for relaxation! Located 55 yards (50 m) from Hyères train station, the ibis Styles Hyères Centre Gare hotel is a quiet and comfortable 3-star hotel with 41 renovated air-conditioned rooms, designed with a travel theme. The hotel features a bar with panoramic terrace, 1 m eeting room, 1 SPA with hot tub and sauna in a relaxing ambiance. There is a free public car park just 55 yards (50 m) from the hotel. 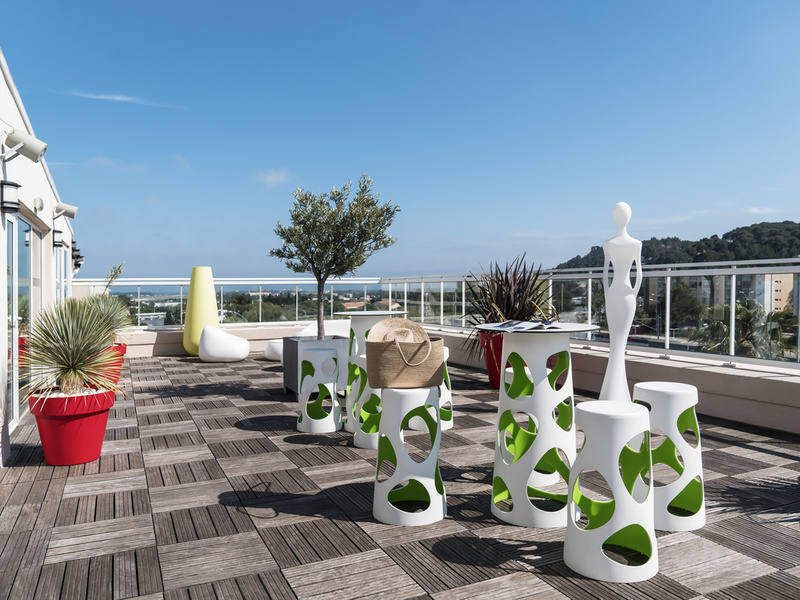 The Bar area at the ibis Styles Hyères Centre Gare hotel is in the middle of a panoramic terrace on the 3rd floor. It is your personal invitation to take a break and admire the incredible views of the sea and medieval town. Good breakfast; great with freshly squeezed juice. Room was ok. All in all quite ok.
We arrived late after a long trip from Paris but reception was very helpful. The hotel was very nice - rooms were spacious and had everything we needed. The breakfast was great and the team were very helpful for our trip to Porquerolles and looked after our bags whilst we were away. Enjoyed our stay at IBIS Hyeres Centre Gare. Being right across from the train station, the hotel is very easy to find. And in spite of being so close we never heard the trains coming through. The room was a bit small, but well thought out (closet, small table and mini sofa/chair). Would have appreciated a shelf in the bathroom for my toiletries bag and an extra hook or rack for the towels. As for breakfast, very fresh (fresh squeezed orange juice machine, pastries..) and varied in a thoroughly enjoyable spot : third floor roof Terrasse (where one can go during the day also for complementary coffee or tea (small game area for young children). The staff were pleasant and very helpful with restaurant ideas. Too bad there isn’t room for a pool which would make it a place for a longer holiday! hotel well situated, quiet, comfortable bedroom and friendly personnel. 1. The public area was taken over by a private party 2. I got bitten by bugs in the bed 3. When I came to check out I was scammed for breakfast despite there being clear sign in the room saying breakfast included. Never use Aocor. Long week-end, trajet vacances, travail. I really appreciate the sweets and bottle water as I came in. I also really appreciated the flat rate for warn drinks. The self service is a very good idea. Nice hotel, friendly staff, great for a stop over or weekend break for families. The 2 adjoining rooms were perfect for our family. The rooms were recently decorated and the beds were very comfortable. Bathrooms were small but really nice (one with shower, one with bath - useful for little ones). Will come again! Nice and cosy hotel close to the railway station. It has a stylish bar-terrace on the roof where also the breakfast is served. The room was clean, modern and large enough. We took a f. suite. Nice, friendly and helpful staff. The area around the hotel was not very exciting but Hyeres downtown is within a 10 minute walk. Add 5 min to get to the old town. The hotel is centrally located, about a 15 minute walk (somewhat uphill) to the old town. The room was a decent size, clean, and quiet with a comfortable bed. Breakfast was good, on a spacious indoor/outdoor roof terrace. Excellent orange juice, good coffee, and good variety of breads. Parking was free--either on the street near the hotel or in the train station parking lot across the street. Fairly easy access to main highways to visit surrounding area. Staff was friendly, helpful, and efficient. Perfect location for my needs, friendly staff added to a great experience. Everybody very friendly. Very friendly staff, lovely cheerful atmosphere, very comfortable room. Couldn't ask for more. Check in was easy and quick. The staff were so friendly and helpful. They should be commended for their excellent customer service. The room was amazing and we were extremely happy with this. The Wifi was great quality as well. The breakfast was of a high standard as well. The kids play area kept the kids happily entertained. We were extremely happy with our stay.